This cleverly disguised caterpillar was found munching in our gardens this fall. 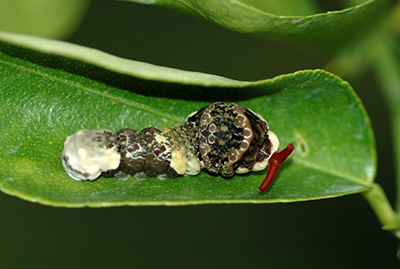 Papilo cresphontes, common name bird poop caterpillar, uses camouflage to resemble bird droppings. Younger instars often rest in plain view on the upper surfaces of leaves where you would expect to find bird droppings. If the “poop” disguise doesn’t work , it can extend bright red osmeterium or hornlike appendages, to frighten away predators. This unusual caterpillar is actually the larva of one of our largest butterflies, the Giant Swallowtail (Papilo cresphontes). It can have a wingspan of 4 to 6 inches, and is mostly black with yellow bands and some red and blue markings. The adult butterfly is a welcome visitor to pollinator gardens and to general landscape plantings. Homeowners, however, may find that just a few larvae of the giant swallowtail can defoliate small, potted or planted citrus plants. Larvae should be handpicked from these small plants so that potential blossom and fruit yield are not drastically reduced. Fortunately, mature trees are large enough to withstand some defoliation. 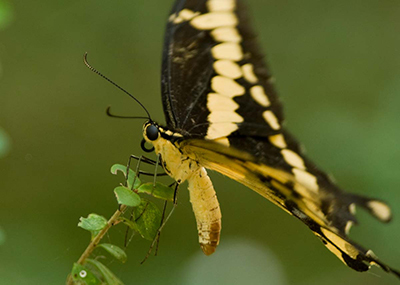 The Giant Swallowtail is found mainly in deciduous forests in the east and citrus orchards in the south and west, where it is considered a major pest because of its habit of feeding on the foliage of most Citrus species. In these areas, it is also known as orange dog or orange puppy. Identified nectar sources include azalea, bougainvillea, Japanese honeysuckle, goldenrod, dame’s rocket, bouncing Bet, and swamp milkweed. 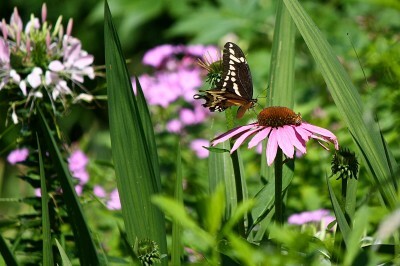 These butterflies have also been known to sip liquid from manure. In the Delaware Valley there can be two generations of Papilo cresphontes between May and August. 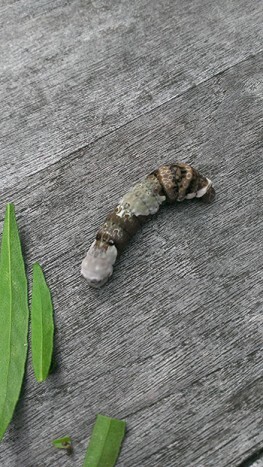 They usually have a darty flight habit and can fly fairly high, making them difficult to notice, but the bird poop caterpillar can be found crawling in your garden. never ceases to amaze me with her tricks! I was pleased to see this post. We were disconcerted to discover these bird poop caterpillars on a potted orange in the patio of our home in Southern California. We’ve never seen or heard of them before and, until this post, didn’t know what they heck they were. Thank you! Glad we were able to help you solve the mystery. It is amazing the critters a gardener finds. Very amazing. I have never seen these before. We have a lot of them on our Satsuma Mikan tree, but they have not started munching yet.There are 2 older ones that are about 2 inches long on the trunk blending s well, you would think they were part of the trunk. Thanks for the article which identified them so quickly! Glad we could help L.